Uniferon® 200 iron injection ensures that your baby pigs will attain hemoglobin levels well above the recommended baseline throughout the critical pre-weaning period. 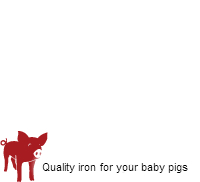 This will help keep your baby pigs healthy, reduce the risk of sub-clinical and full-scale iron deficiency anemia and ensure a stronger growth rate before weaning. 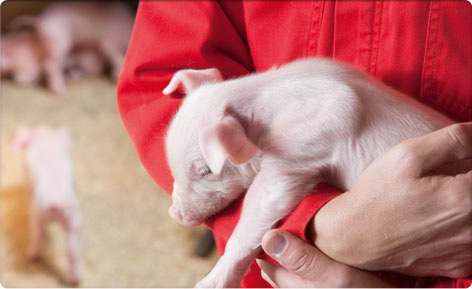 Read more about the benefits of Uniferon® 200 for your baby pigs. The product information provided in this site is intended only for residents of the United States. The products discussed herein may have different label indications in different countries. The animal health information contained herein is provided for educational purposes only and is not intended to replace consultation with your veterinarian. All decisions regarding animal health care must be made with a veterinarian, considering the unique characteristics of each operation and producers situation. Uniferon® 200 is CVM/FDA approved New Animal Drug Application (NADA) # 134-708. Uniferon® 100 is CVM/FDA approved New Animal Drug Application (NADA) # 106-772. Uniferon® is a registered trademark of Pharmacosmos A/S. All rights reserved. Pharmacosmos, Inc. is a wholly-owned U.S. subsidiary of Pharmacosmos A/S.